As Robert Frost famously wrote in his poem, Mending Wall, “Good fences make good neighbors”. Fences keep livestock from crops, children from traffic and delineate boundaries. 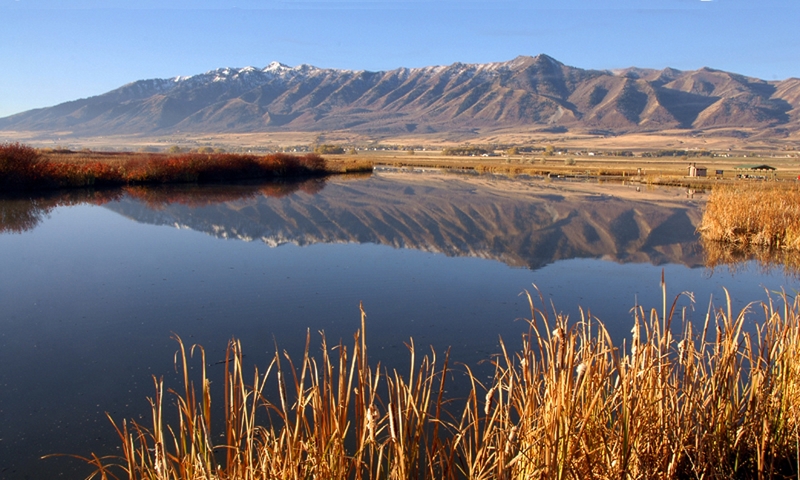 In the intermountain West, fences are important to keep livestock where we want them and away from where we don’t. But wildlife of open sagebrush habitat did not evolve with fences. 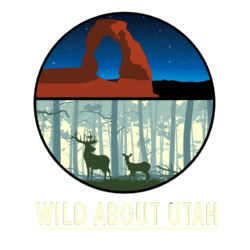 Sage Grouse and Pronghorn Antelope have had a particularly difficult time adapting. 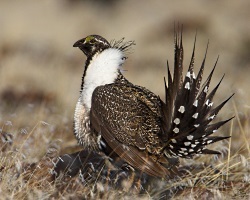 Sage Grouse are stout, chicken-like birds found only in sagebrush, whose foliage features prominently in their diet. Sage Grouse were once abundant, but their numbers have plummeted due to habitat loss. Today they are candidates for listing as an endangered species. In flight, these large bodied birds like to skim over the sagebrush canopy and so doing, careen right into fences. One Utah study attributed 1/5 of Sage Grouse deaths to fence collisions. At dawn during the spring, male Sage Grouse congregate on ancestral dancing grounds to attract mates. The birds fly to these lek areas before sunrise so may not be able to see a fence before they collide. Other areas of special concern include the crest of low hills and the midst of wide open flats. Where grouse are common, flagging a fence or otherwise making it more visible can help considerably to reduce airborne fence collisions. 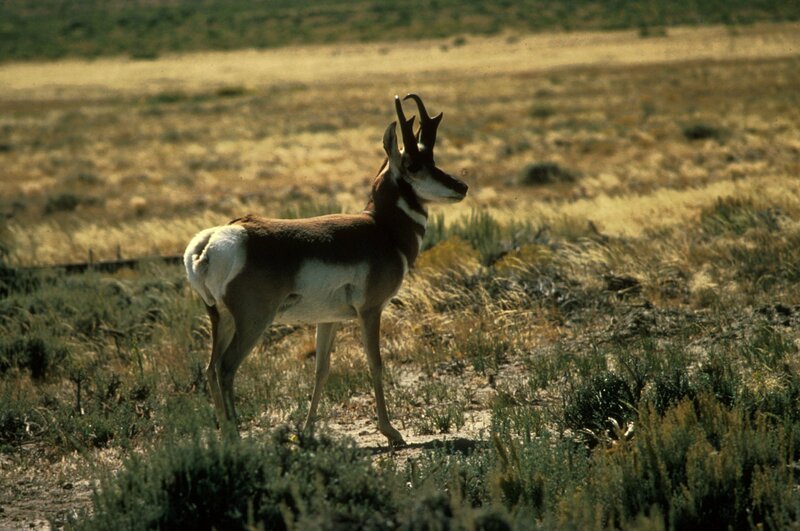 The perspective of Pronghorn Antelope and Sage Grouse could be summed up in the lyrics from a Cole Porter song: Don’t fence me in. 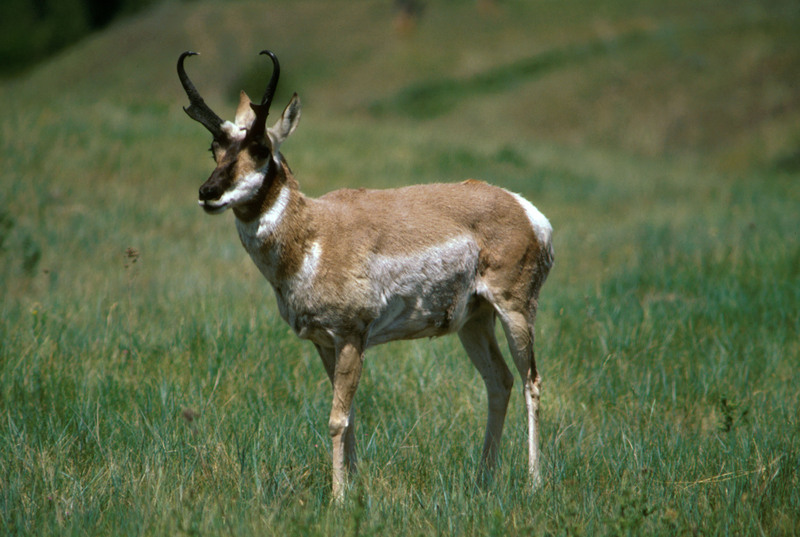 The American pronghorn has an identity problem. It’s Latin name Antilocapra Americana means “American antelope goat.” But the fleet-footed animal of the American West is neither an antelope nor a goat. It is the sole survivor of a family of hooved animals that flourished in the Miocene, from 7-25 million years ago. More than 13 species of that family have been found in the fossil record, but only one pronghorn survived to modern times. Many consider the pronghorn to be the fastest land animal in the world. Certain individuals have been clocked up to 60 miles an hour. It’s true that cheetah can go 70 miles per hour,–but only for several hundred yards. The pronghorn on the other hand, can go for great distances at high speed without breaking a sweat, leaving pursuers such as coyotes and wolves in the dust. Mountain lions occasionally creep up behind them, but that’s tricky in the open grasslands and shrub steppe that pronghorns prefer. 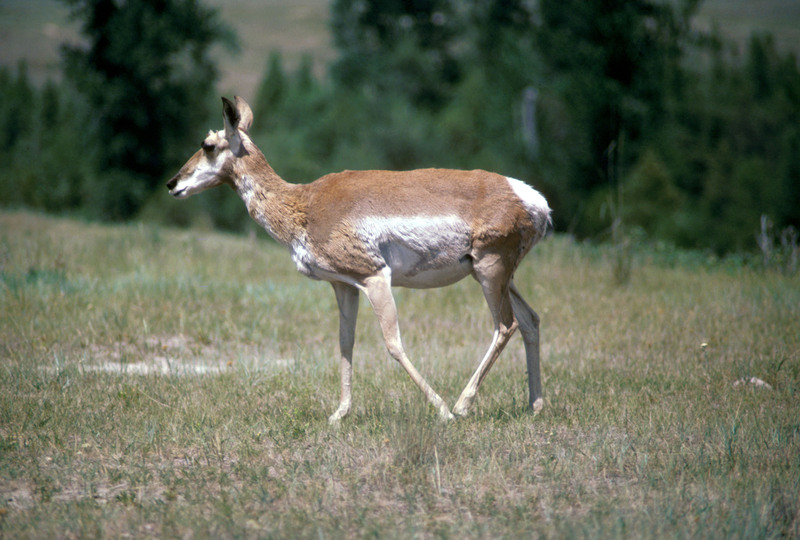 Simply put, no land mammal on earth can keep up with the pronghorn over a significant distance. So why is this animal so implausibly fast? 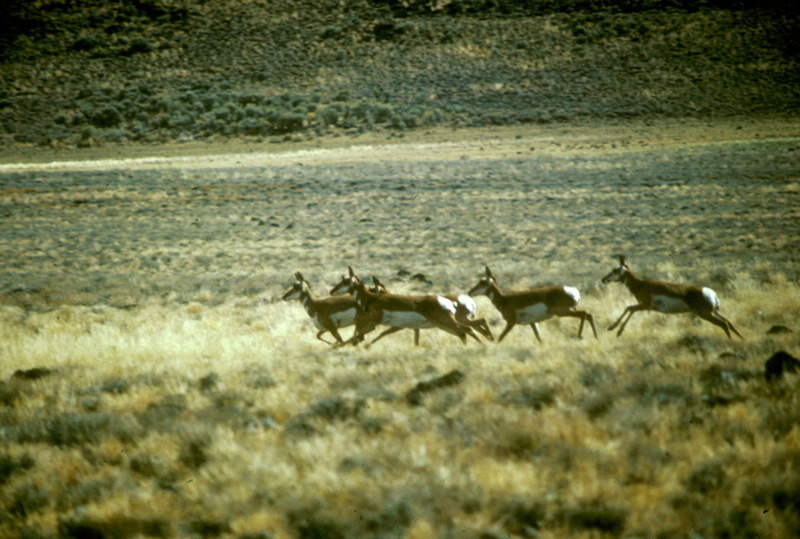 John Byers of the University of Idaho believes that the pronghorn and its relatives evolved traits to enhance speed under the influence of ghost predators. These predators are now extinct but their existence is memorialized through the adapted traits of their prey. Before the late Pleistocene extinction, a variety of carnivorous megafauna filled grasslands often referred to as the American Serengeti. The giant short-faced bear, the American lion, a jaguar, a form of hyena and the saber-toothed cat were likely ambush predators of the pronghorn. But the most compelling reason for the pronghorn’s improbable speed is the presence of the North American cheetah. This long -limbed cat with powerful heart and lung capacity set off an evolutionary arms race with the pronghorn. Natural selection favored speed since slow cats went hungry and slow pronghorns were devoured. 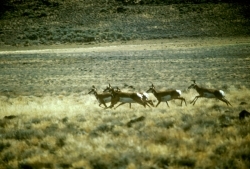 Nowadays, lacking the need for such swift getaways, it’s possible that the pronghorn has slowed down. But if slowing down is 60 miles an hour, imagine what a high speed chase with the powerful prehistoric cheetah must have been like!